Complex, wildly intense flavors make for the most memorable of cheddars. Our conveniently packaged 8-ounce Dairy Bar has a dense and slightly crumbly texture and a milky white color. Redolent of the grassy, clover-covered fields of the North Country, we like to savor it with full-flavored ingredients like smoked meat and spiced chutney. 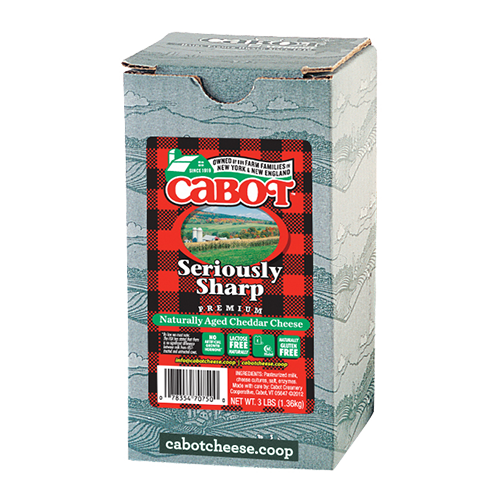 This is the cheese that will make a box of macaroni weep with joy or your fondue pot go weak at the knees. 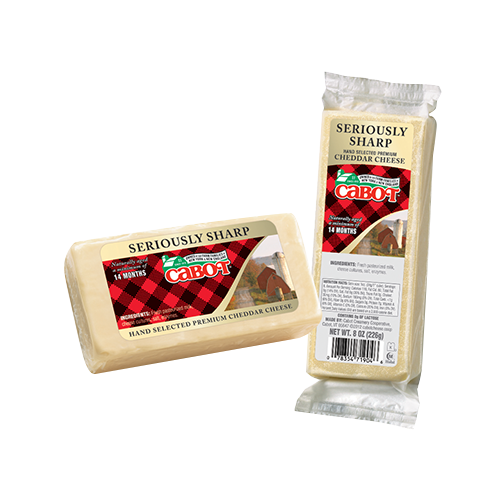 Our Lactose-Free Seriously Sharp Cheddar will turn a cheddar enthusiast into a cheddar aficionado. The 8-ounce Dairy Bar has a dense and somewhat crumbly texture made in traditional white and yellow. Indicative of the grassy, clover-covered meadows of the North Country, we like to savor it with full-flavored ingredients like smoked meat and spiced chutney. This is the cheese that will make your fondue pot go weak at the knees. 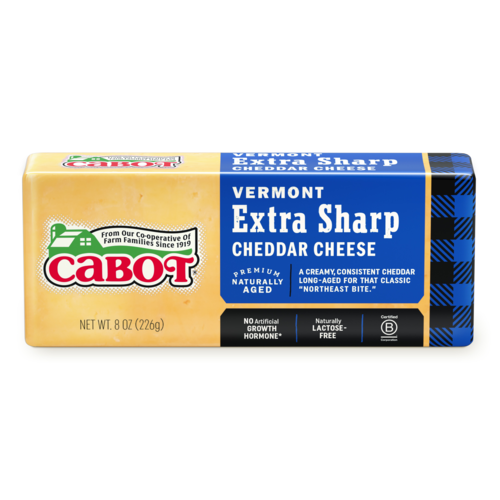 Whether you need to pile a party tray high or keep the whole family's brown bags brimming, our 2-pound brick of Lactose-Free Seriously Sharp Cheddar means you'll be well stocked. 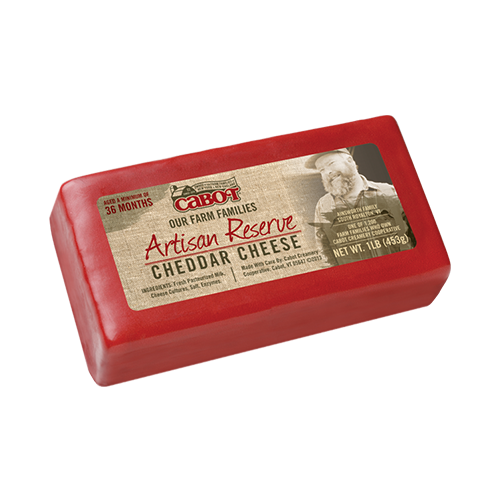 It's all the tart, savory taste you love, packaged for freshness in a wax brick that lasts for weeks. 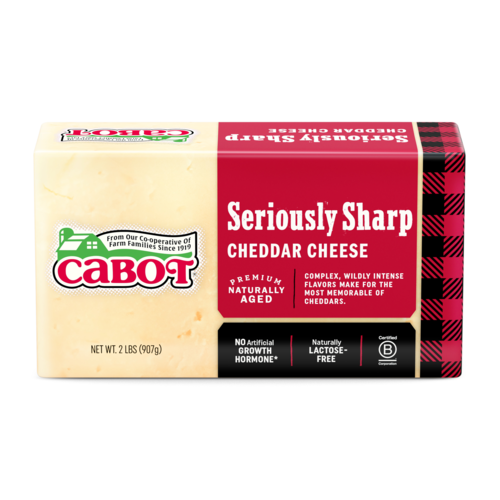 Cabot's Seriously Sharp cheddar is no joke! 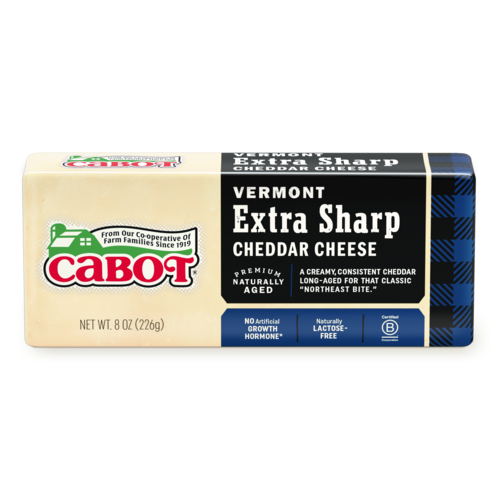 Get ready for the complex and intense flavor that sets this cheddar apart from the crowd. 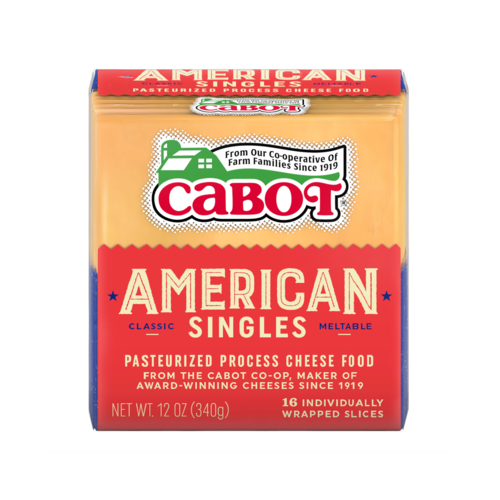 Ingredients: Pasteurized milk, cheese culture, salt, enzymes, annatto (if colored). 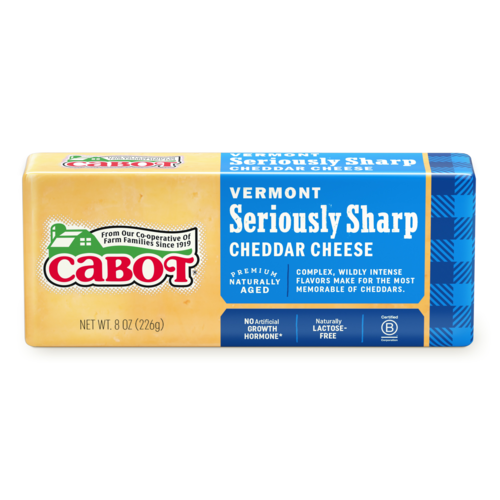 Can't get enough of the layered, rich taste of our Lactose-Free Seriously Sharp Cheddar? Take home a 3-pound brick today. 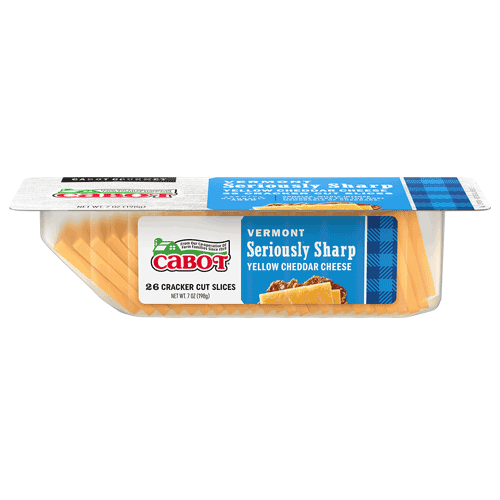 Keep this larger size on hand, and you won't have to worry about running out of the classically delicious taste of the North Country, no matter how many steaming servings of gooey mac'n'cheese or flavorful grilled cheese sandwiches you cook up! 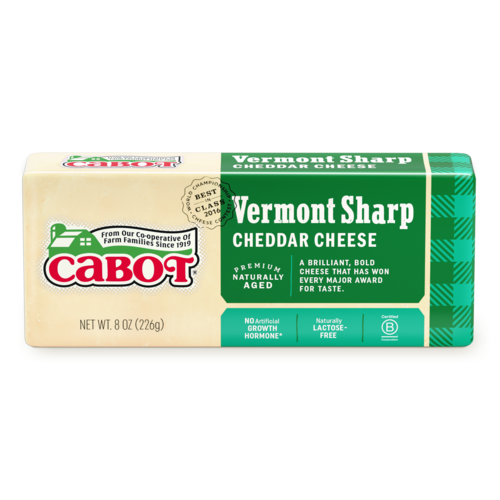 Bring home a block of this sophisticated, complex cheddar as the perfect addition to a bold recipe. Our Deli Bar is aged a minimum of 14 months to achieve just the right combination of nutty, tangy zest. Add thick-cut slices to a hearty sandwich, sprinkle crumbly chunks over a fresh salad, or stir into your favorite steaming recipe for a taste that will keep you coming back for more. 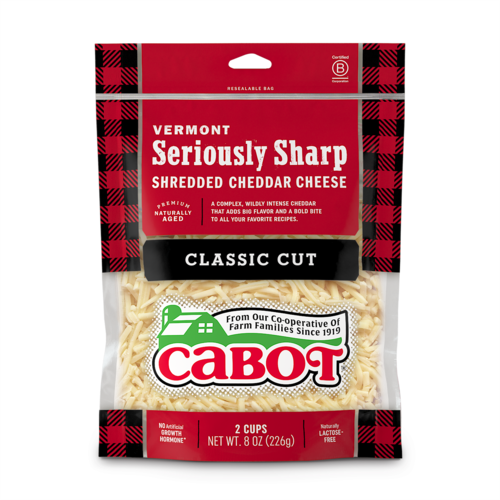 Pick up an 8-ounce package of our Seriously Sharp Shredded Cheddar Cheese and start cooking up a storm without the added hassle of slicing and grating. 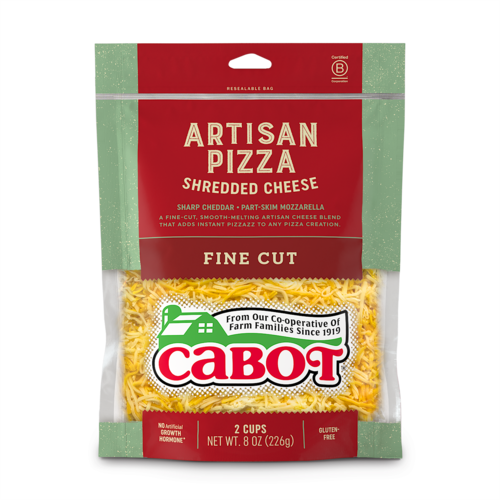 Great for sauces, pizzas, salads, and tacos, our shredded cheese delivers the flavor you love fast. 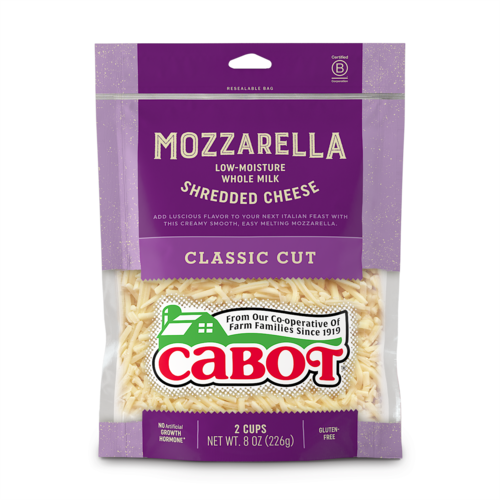 Ingredients: Pasteurized milk, cheese culture, salt, enzymes. Potato starch, corn starch and calcium sulfate added to prevent caking. Natamycin (A natural mold inhibitor). Snacking just got serious again. 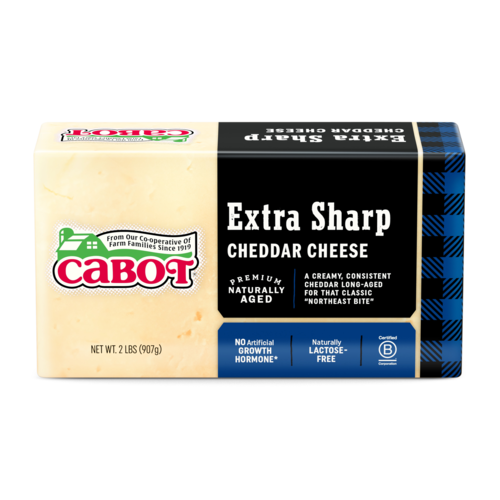 Our Seriously Sharp minis are the perfect size for any occasion, all the big flavor of our favorite aged cheddar in single servings of only 80 calories each. 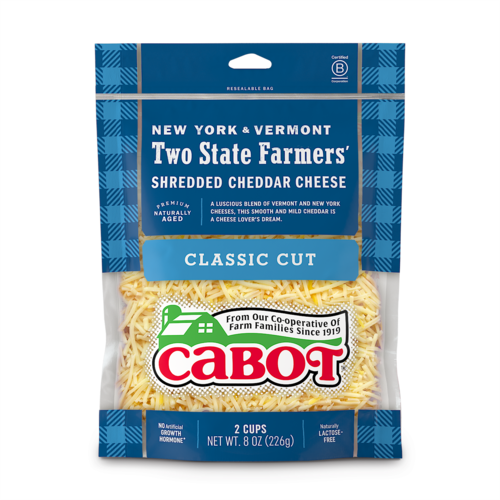 Available in handy 24-count bags, you can keep your cheese drawer filled for anyone rummaging around in the fridge for something to eat, or take the whole bag with you when it is your turn to furnish the snack at school or work. 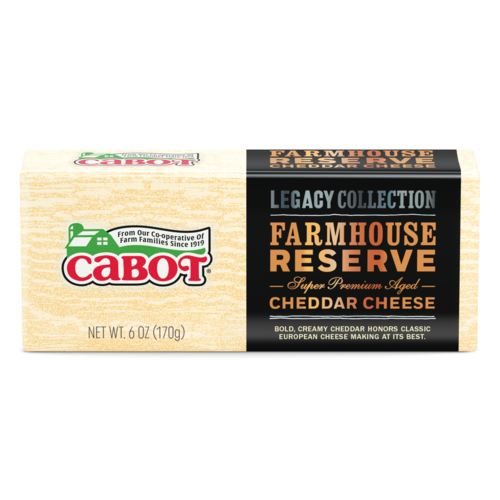 Bring all the aged, textured sophistication of our Lactose-Free Seriously Sharp Cheddar to your next gathering—without any of the hassle! 7-ounces of pre-sliced, mouth-watering, cracker-sized slices for the perfect addition to any sampling of crackers, deli meats, or earthy spreads. 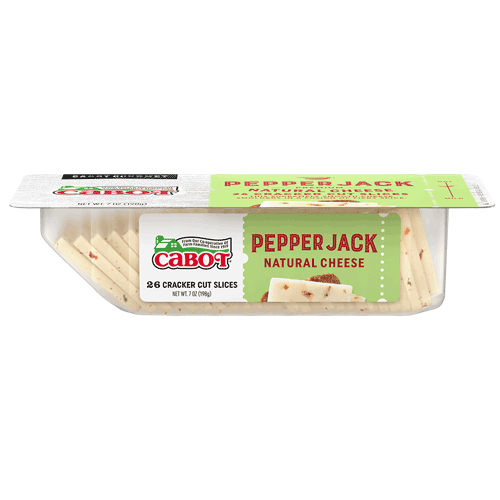 Conveniently packaged in a ready-to-use tray, these slices are easy to serve and delicious to savor. 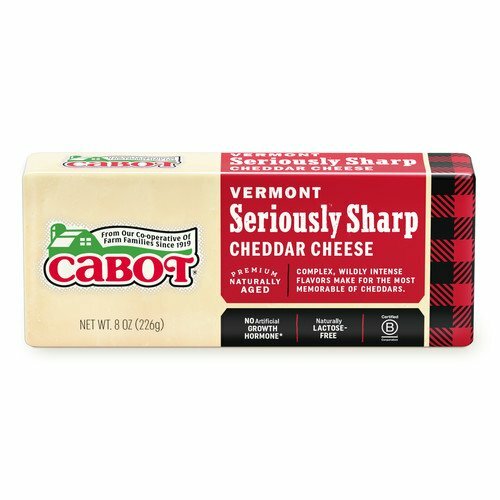 Whether you prefer yours white or yellow, Cabot cracker cuts bring the ultimate convenience to the wildly intense flavor of our Seriously Sharp Cheddar cheese. 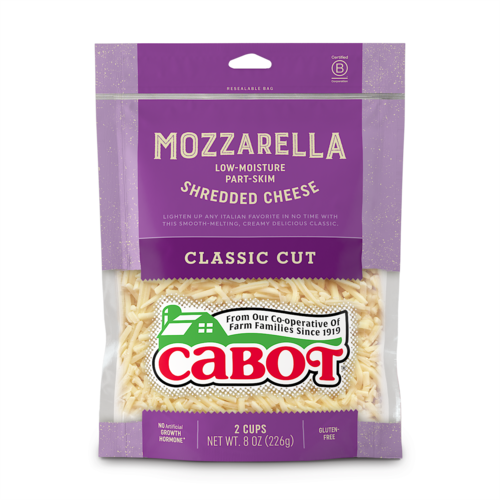 These pre-sliced portions make it easier than ever to experience the mighty tang and complex, nutty flavor of the sharpest cheddar we have to offer. Pair Seriously Sharp with full-flavored foods that can stand up to its bite—like smoked meats, spicy chutneys and super-sweet jams. 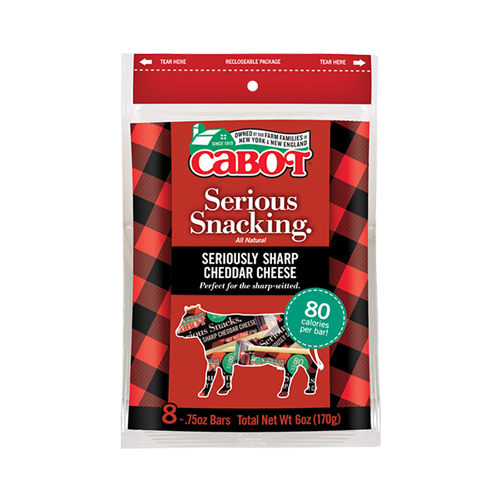 Our Serious Snacking package delivers 8 individually wrapped snack-sized bars. 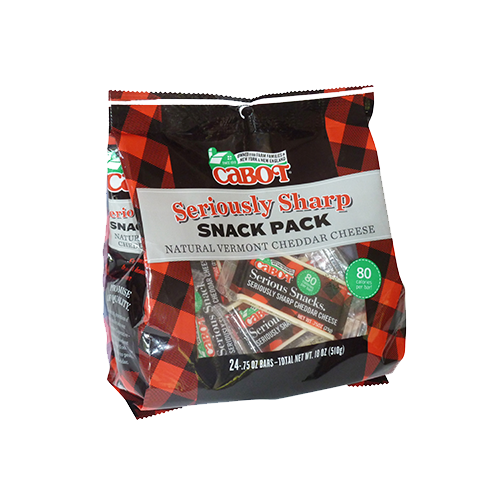 At only 80 calories each, these dense, tangy bites of the North Country are great for tossing into a packed lunch or purse as you head out the door. Or bring a whole Seriously Snacking bag along on your next family picnic, and keep the whole crew munching and smiling.